Electronic Money, Monetary Policy, Central Banks. Monetary policy is one of the most important tools used by economic management and seeks to achieve economic stability (Castells, 2017; Mishkin, 2007). Monetary policy is considered the cornerstone of macroeconomic policy (Binder et al., 2017). It is one of the main components of it. It has a great impact on the state of the national economy at the macro level, not to mention fiscal policy. The state intervenes through monetary policy, which is planned in the central bank, which should play a more effective role in controlling the cash balance and control of finance and thus control of commercial banks and financial institutions, especially in view of the spread of electronic money and increase its use as a form of transformation to the digital and virtual economy (Qin, 2017; Rogoff, 2017). However, the terms of the banking and financial function have undergone profound changes, as they have moved from their traditional functions, which were mainly in the collection of savings and investment in return for the return of mediation, but things have changed radically as they resorted to exploit the enormous technological progress in the systems of communications and informatics to employ them to serve their development objectives Qualitative and quantitative banking and financial services, and thus the transition to financial and banking mode. There is a great deal of interest among economists and monetary and banking authorities responsible at the local and international levels on the reflection of the spread of electronic money on the functions of central banks and their responsibility for the management of monetary policy, which led us to raise the effective of electronic money on the effectiveness of monetary policy (Forrest et al., 2018). Thus, the primary objective of this research is to address the conflict of opinion and difference on the impact of electronic money on the functions of the central bank and monetary policy. In addition, to determine the effects of electronic money on the role of central banks through management of monetary policy. It represents the monetary authority of the country, which occupies the top of the banking system. It sets the objectives of monetary policy, follows a series of measures and measures to implement this policy, and is the bank responsible for issuing the circulation of circulation in circulation in each country. Monetary policy the term monetary policy appeared at the beginning of the nineteenth century, and the development of interest since then, where the concept of monetary policy definitions of several were formulated from a specific point of view of the writer and economic researcher in the economic problem, which binds them all within the general framework of the economy )Hassan, 2009). Monetary policy "is the set of actions taken by the state in the management of both money and credit and regulation of the overall liquidity of the economy" (Ali 2008). According to Burda (2009) the monetary policy can be defined as certain procedures and arrangements undertaken by the authorities of finance concerning the monetary stock in order to achieve certain objectives within a certain period of time. Thus, monetary policy garnered the attention of economists due to its important effects on every-day economy such as controlling the amount of money and economic stability, controlling the trends and structure of economic activity by influencing the size of credit along with its structure and domains. When a country has a monetary policy, it must decide whether the policy is to control only inflation or affect national production along with the extent of unemployment and the exchange rate (Galí, 2015; Weale et al., 2015). It can be said that monetary policy has several objectives that vary from one country to another, or even from time to time in the same country (Table 1). The central bank achieves the strategic monetary policy objectives by choosing the appropriate tool of monetary policy tools, then the primary objective, followed by the medium one and finally the ultimate objective. However, this obliges the central bank to use monetary targets linked to each other until the final goal is reached or the strategy would be deemed as incomplete )Abdul, 2006). Although central banks of developed countries have a single final objective such as price stability, monetary policy objectives can be divided into several levels, or three levels: primary, intermediate and final objectives. The economists divide the tools of monetary policy into quantitative, quantitative and direct tools. These divisions vary from one economy to another (Salehi, 2006). A cash value stored electronically on an electronic medium such as a computer card or memory; accepted as a payment method by non-issuing contractors, and made available to users to be used as an alternative to cash and paper currency, with the aim of generating electronic transfers of payments of specific value (Mahmoud, 2005). This definition falls within the broad trend of e-money, as the authors of this trend see electronic money as an electronic means of payment. An electronic stock of the amount of money on an electronic means such as a plastic card that may be used to withdraw cash or settle payments to other economic units other than those that issued the card, do not require to have a bank account when the transaction is made and it is one of the tools and means of prepayment (Ahmed, 2014). This definition defines the narrow trend of electronic money, and the most accurate and closest definition of health is among the previous definitions. Through previous definitions, electronic money can be said to be an electronically stored cash value used to settle small payments. The first system is electronic money portfolio used to pay or settle transactions through the Internet, and consists of a plastic card installed on the back of a small computer with an electronic memory to store information and purchasing power in the form of electronic units suitable to meet low-value debts (Ahmed, 2014). It is clear from the above definition that the electronic money portfolio is based on three pillars: A card equipped with an electronic memory that allows storage and calling, which is called the smart card La carte à puce (Mohammed, 2009). The units shipped on the card are called electronic units, charging the units on the card in advance for use in the payment process is called prepayment or prepayment (Mahmoud, 2005). It is called a cash portfolio on the basis that it stores units with financial values that can be used to pay the price of goods and services, such as money; an electronic portfolio on the basis that it does not contain paper or real money but contains units that are electronically transferred and represent specific financial values (Zine El-Din, 2003). The second system is digital or virtual money it is recording of the value of the currency documented and restricted in electronic form. The digital currency unit contains a reference number, which is not repeated and distinguishes the digital currency, like the serial number for the cashiers, and is called digital money because it performs the functions of money and it appears in a digital image and circulates electronically. The prepaid or prepaid payment mechanisms enable those who make payments through the use of the Internet, commonly known as net money or digital liquid money. Thus, digital money is an expression used primarily to describe a variety of low-value payment mechanisms; the most important characteristic is that their value is prepaid or that its value is stored inside (Ahmed, 2014). In examining the literature, previous studies have determined that the effects of electronic money on the role of central banks in their management of monetary policy (Zine El-Din, 2003; Ahmed, 2014; Galí, 2015; Weale et al., 2015; Qin, 2017; Rogoff, 2017; Berentsen, 1998). In that regard, an enhancement of the functions of the central bank and monetary policy will have an added impact. In addition, Popovska-Kamnar (2014) determined that the possible influence of e-money on the monetary policy is also a topic of professional interest overall. E -money has the potential to substitute currency in circulation, which is part of the monetary aggregates from the balance sheet of central banks. Now, the influence is not significant-central banks are recording very low decrease of currency in circulation as a result of increase of e-money. But still, having in mind that any innovation takes time to be accepted on the market, in the future central banks and experts needed to follow the developments surrounding e-money more closely and more carefully. The Survey of developments in electronic money and internet and mobile payment (2004) BIS, no central bank has registered influence on their balance sheet caused by reducing currency of circulation as a result of e-money. Also, there are no data registered for losing revenues. Although this survey was taken 10 years ago, the conclusions are still valid for the present development of e-money. Durgun and Timur (2015) defined the possible effects of electronic payments, which are distinct from conventional payment systems, on central banks and their policies. Since the existence of civilizations, many different values are used for exchange of commodities, goods and services. By the development of modern economics theory, banknotes which is easier to produce, has been started to use instead of precious metals. The monetary value of the banknotes and mintage responsibility were transferred to the central banks. These central banks are tasked with controlling the monetary policies, generally with the goals of economic growth, price stability and stability of financial systems. Pan, (2005) analyzed deeply the impact of e-money on independence of monetary policy, monetary instruments and monetary targets. Then it indicates that the central bank should make a careful research on the development of e-money and establish suitable macro-economic management policy. Berentsen (1998) studied the effect of replacing central bank currency on the narrowly defined stock of money under various assumptions regarding regulatory policies and monetary operations of central banks and the reaction of the banking system. But the emergence of electronic money will have a significant impact on the demand for banknotes issued by the Central Bank and therefore its revenues will decline as the process of issuing electronic money can be handled by institutions other than the Central Bank. The possibility of electronic money as a replacement of customary money: Banknotes issued by the central bank represent a large proportion of the current payment methods M1, which include cash circulating outside the banking system in addition to current deposits in local currency, and the possibility that electronic money replaces the banknotes that The increase in the demand for electronic money is likely to affect total money supply in a manner similar to the risk of creating unchecked credit. The term "credit creation multiplier" refers to the relationship between the original deposit and the increase in it, and the total deposits that commercial banks can create, equivalent to the increase in the original deposits in the opposite of the cash reserve ratio. If we assume that the cash reserve on deposits is 10%, the credit creation multiplier will be the principal of the deposit multiplied by 10, which is the cash reserve ratio inverted. Assuming that electronic money deposits have multiplied without committing to a cash reserve, the credit multiplier will be endless. On the other hand, if individuals are willing to keep cashable balances, the total demand deposits needed or desired by individuals will decrease, thereby reducing the supply of money by the central bank and in key economies. Cash is the biggest component of central bank liabilities. The continued use of electronic money will significantly reduce the budgets of central banks. Issuance institution: The identification of electronic money exporters is a thorny issue that will face any legal regulation of this money, and there are many options in which the government can determine who will be allowed to issue this money. The state can allow one of the following entities to issue electronic money: Commercial banks, non-bank financial institutions (non-bank) or non-financial institutions. The central bank is located at the top of the banking system, which supervises and regulates this device; it is the re-discount commercial paper and keeps the deposits of commercial banks, the lender of last resort to these banks. The emergence of electronic money has affected the role of the central bank as a bank of banks as this role is beginning to decline; some central banks may continue to play the role of the last lender of large financial institutions, but the need for this lender may decline in a world where information is transmitted immediately in almost every Activities and institutions. The Central Bank acts as the Chancellor and the financial agent of the government, which acts on its internal and external financial transactions as well as the body that oversees the implementation of an important part of the government's general economic policy, between competing private sector enterprises exporting electronic money. The function of credit control is one of the important functions of the Central Bank, which works on credit control and guidance to certain sectors, and therefore uses different tools to achieve this function These tools in Direct monetary policy tools (quantity and how) and indirect. With the advent of electronic money, it seems that any attempt by the central bank to guide will be futile, because of the increasing trend of banks to issue such money, and online payment services are often difficult to control or direct, because the Internet is only An information network that does not have a traditional physical presence and is not subject to political boundaries or social barriers. Assuming that a government has passed legislation restricting or preventing financial transactions via the Internet, we can expect the public in this country to look for opportunities to Finance charges, the nature of the international information network (Internet) makes it difficult for central banks inventory of electronic transactions balances, and this may lead to easing the grip of the central bank in the credit guide. 1. Either you buy a lot of assets from non-bank institutions, and grant more loans. 2. Either you buy more assets from the central bank. The increased demand for assets in the financial markets will lead to lower interest rates. That is why banks will prefer the second alternative. As long as the central bank stabilizes the interest rate of some short-term assets, banks will buy back assets from the central bank. Of the sale of electronic money in reducing its liabilities in the face of the central bank, and in the case of whether the sources of electronic money offer more electronic money by granting loans, that is to create new money without being compensated by the decline of money elsewhere, in such The situation will be from a It is difficult for the central bank to control the level of interest rates if the banks' authority to grant these loans remains unrestricted. As it is known, the central bank can control the volume of credit by changing the rate of rebate. If the expansionary trend and expansion of loans are to reduce the rate of rebate, commercial banks accept the discount of their cards with the central bank and thus increase their cash flow; this is in opposition to the reversal trend. The emergence of electronic money has made the reserves of commercial banks increasing, as explained earlier. Thus, the re-discount rate will not have a significant impact on credit volume control, because the banks' demand for the re-discount of commercial paper from the central bank will be reduced due to increased cash flow And the reduced need for the central bank to grant this liquidity, whatever changes in the price of re-discount it will not affect the volume of credit because there is no request to re-discount the commercial paper. At first place: The use of electronic money by individuals will gradually lead them to refrain from maintaining liquid cash (cash). This will result in commercial banks repaying more than their needs to the central bank in order to increase their cash reserve ratio. The reserve size will limit the central bank's ability to sell securities to absorb part of the bank's liquidity and thereby influence its ability to grant credit. In the case of central banks buying securities from individuals to extend credit, individuals will use their electronic money to purchase these securities, but the lack of a link between electronic money and any balances with commercial banks, this process would not have it However, the impact of electronic money on the open market operations of the central bank will depend mainly on the prevalence of the use of electronic money, the more e-money deal marginally, the less impact on the effectiveness of The central bank's open market policy On the contrary, the use of electronic money as an alternative to legal money may have a significant impact on the intervention of the central bank as a buyer or seller in the stock market, and these effects may extend to the level of interest rate expected to change As the purchase of securities will lead to an increase in the liquidity ratio, thus increasing the money supply, leading to a decrease in the interest rate and the opposite occurs when the Central Bank sells the securities. The expansion: The use of electronic money will reduce the budget of central banks in a visible manner and at a certain level may limit this reduction the ability of central banks to conduct open market operations. There are those who believe that electronic money will affect open market policy but in a positive way, where they see that the use of open market operations electronically over the network, will be more rapid and efficient than the traditional medium, where it reaches a broader base of customers internally and externally, and hence the cash balance can return faster, but it should be noted that this method will be very limited in developing countries because they lack most of their requirements. Commercial banks must maintain a certain percentage of their deposits with the Central Bank as a cash reserve in the form of credit balance. The Central Bank can control the ability of commercial banks to grant credit by using these tools-the statutory reserve-by changing its percentage. 1. The money in the bank's treasury increases by 1000 pounds, the bank's liabilities are the same amount, which is also equivalent to electronic money. 2. The increase in the total amount of the sum of 1000 pounds will increase the Bank's reserves because the increase in the amount of electronic money does not require the reserve of part of it as a reserve or if there is an obligation to reserve a reserve of 10% on electronic money, the reserve will increase by 100 pounds in reserve. The effectiveness of the policy of the legal reserve as a tool for monitoring credit: From the above, we find that the size of reserves increases with the use of electronic money, thus increasing the liquidity of commercial banks, reducing the demand for reserve held by the Central Bank, and thus the emergence of electronic money will limit the effectiveness of reserve policy Due to the fact that commercial banks will have a surplus in deposited money, their liquidity will increase significantly and the ratio of customer deposits (10% in the previous example) will not be affected as required to credit or encourage credit. Electronic money can raise a range of effects on monetary policy by influencing its tools and objectives. Electronic money can also open the door to many crimes such as tax evasion, money laundering and counterfeiting, in the absence of a unified legal system between countries to regulate money circulation so it was necessary to establish controls for the issuance of such money. Any legal regulation of the subject of electronic money should not only renew the nature or character of the issuer, but also establish a set of controls that will ultimately prevent the economic and legal risks that are expected to occur when issuing such money. Formality refers to the form and wording of the legal texts governing the subject of electronic money, and may be objective, ie, whether the issuer of electronic money or the regulatory bodies of the institutions that export the money. These are the rules related to the form and wording of the legal texts governing the subject of electronic money. Therefore, the provisions of the legal regulation on electronic money must be very clear. The legislature should define the concept of electronic money and distinguish it from electronic payment methods. For single-purpose or limited-purpose electronic cards, and the contractual arrangements that may arise between the various parties dealing with electronic money, commenting on electronic money should clearly reflect the obligations and rights. Subject to the institutions of exporting electronic money for supervision and careful control: If the Central Bank of the process of issuing electronic money, in this case there will be supervision on the other hand, but the difficulty arises when the order to issue this money to another bank. In such cases, these bodies must be subject to strict supervision and strict control by specialized government agencies such as the Central Bank, for example, to prevent the risks that may result from the issuance of these institutions for electronic money. The need for security controls: The legislation on electronic money to address the financial problems expected to occur such as money laundering or security issues, so the attention should not be focused only on the issuer of electronic money, but should also focus this legislation on the types of electronic money to be issued. The obligation of the issuer of electronic money to submit periodic statistical statistics reports: As has been shown earlier, electronic money may affect monetary policy through its impact on money supply, and in anticipation of this it is necessary that the credit institutions allowed to issue electronic money to provide data Periodic statistics to specialized monetary authorities such as the central bank. Compelling e-money issuance institutions to accept their conversion to normal money: Any legal regulation of e-money must include a provision for the obligation of e-money exporters to accept their conversion to legal money at the rate of parity or equivalence at any time the holder of such money is required to change it. Compelling the source of electronic money to maintain a reserve with the central bank: The central bank must impose restrictions on the monetary reserve on electronic money exporters in anticipation of any significant increase in the creation of electronic money, which ultimately affects the monetary policy and maintain this commitment to lead to stabilize prices. The need for international legislative coordination and cooperation: As a result of the international dimension of electronic money, the national legal regulation of such money will not be fully complemented by international organization, coordination and cooperation. It is therefore necessary for States to cooperate through collective and bilateral agreements explaining the responsibilities of all citizens in the country. In view of the effects of electronic money, the latter can contribute to the high rates of economic crimes such as money laundering, tax evasion and currency counterfeiting. Therefore, controls governing the issuance and circulation of electronic money are necessary to combat such crimes. The existence of international cooperation will limit the possibility of the number of crimes increased significantly. In this part of the study, we will discuss the relationship between the volume of electronic money traded and the effectiveness of implementing the monetary policies that the Central Bank is planning as a case study on the Arab Republic of Egypt as one of the largest Arab economies in the field of electronic commerce over the last ten years. In the study of Tables 1 and 2, there is a strong inverse relationship between the volume of electronic money traded in the Egyptian market and the discount rate determined by the Central Bank in an attempt to reduce the volume of money traded in the Egyptian markets during the period (2007-2016) This relationship shows that the greater the amount of electronic money traded, the central bank tried to reduce the re-discount rates to reduce the liquidity available in commercial banks in an attempt to control the credit operations carried out by banks and so that it can exercise its role in monetary policy effectively, lead to reduce the effectiveness of the monetary policy of the central bank in terms of re-discount rate, which the central bank is forced to the downwards to try to increase the effectiveness again. 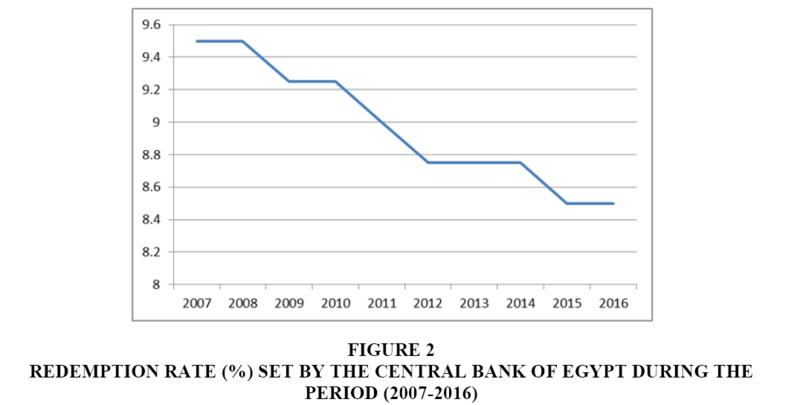 There was also a strong positive correlation between the volume of electronic money traded in the Egyptian market and the volume of open market operations carried out by the Central Bank of Egypt, which seeks to reduce the volume of money traded in the Egyptian market during the period 2007-2016. The amount of electronic money traded The central bank tried to increase the open market operations and raise the interest rates it pays to commercial banks to buy securities to reduce the liquidity available in commercial banks in an attempt to control the credit operations carried out by coffee K so can the exercise of its role in monetary policy effectively, ie to increase the electronic money size leads to reduce the effectiveness of the monetary policy of the central bank in terms of open market operations, which the central bank is forced to the increase of interest rates, which is paid to try to increase the effectiveness of the new. 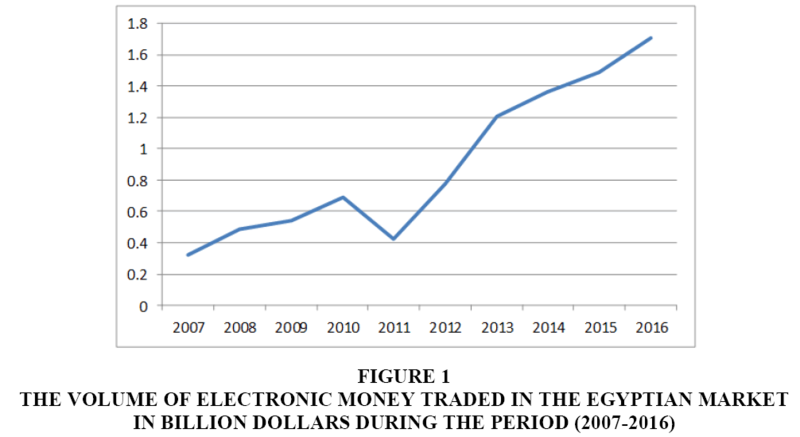 There was also a strong positive correlation between the volume of electronic money traded in the Egyptian market (Figure 1) and the size of the legal reserve set by the Central Bank of Egypt for commercial banks, which seeks to reduce the volume of money traded in the Egyptian market during the period 2007-2016 (Figures 2 & 3). The amount of electronic money traded The central bank has tried to increase the legal reserve ratio, which is required by commercial banks to reduce the liquidity available in commercial banks in an attempt to control the credit operations carried out by the banks and so that it can exercise its role in Monetary policy effectively. In other words, increasing the volume of electronic money leads to a decrease in the effectiveness of the monetary policy of the Central Bank in terms of the size of the legal reserve, (Figure 4) which forced the central bank to increase its rates in an attempt to increase this efficiency again (Table 3). 1. The need to provide the infrastructure to deal with electronic money, such as ATMs and the final points of electronic payment "TPE"; Home banks. 2. Stimulate merchants and places of service such as restaurants, hotels and institutions to accept electronic money in their dealings by giving them some advantages. 3. To develop the culture of society with regard to the use of money and electronic means of payment; to provide adequate publicity for electronic money and the privileges it gives to its holder. 4. International cooperation against electronic money frauds. 5. Innovation of financial regulations in a way that coincide with monetary payment systems and money transfer via electronic means. The government does not mention “contacts” in its legal regulations texts instead of “communication”. 6. The need to draft a law clarifying a set of conditions that ensure the issuer of electronic money to manage the various risks arising from this money in the future. 7. The State should develop training and training programs for workers in banks to acquire the expertise necessary to detect attempts to manipulate and limit electronic money. 8. Circulation of the use of debit cards, cash and postal cash payment; and social security cards. 9. Development and modernization of electronic payment systems in line with global economic and technological developments. 10. Adopting defense, regulatory, legal and regulatory lines that make it possible to deal with financial and electronic banking products to serve the national economy. The electronic money is a new method of payment. It is the last thing that was invented in electronic payment methods. It was characterized by a number of characteristics that made it one of the biggest challenges facing the activities of central banks. This put their impact on the central bank functions in question, especially the impact on monetary policy. This study was designed to analyze these effects and highlight their various aspects through Identification of the monetary policy, Identification of electronic money, to highlight the various effects of the use of electronic money on the role of the central bank in the management of monetary policy. The study reached a number of findings the effect of electronic money on the price of re-discount,he impact of electronic money on the open market, the impact of electronic money on the legal reserve, the size of the reserve held by the Central Bank, the effectiveness of the policy of the legal reserve as a tool for monitoring credit And that there Regulations for the issuance of electronic money represented in formal controls for the legal regulation of electronic money and the objective controls of the legal organization of electronic money is Subject to the institutions of exporting electronic money for supervision and careful control, the need for security controls, The obligation of the issuer of electronic money to submit periodic statistical statistics reports, compelling e-money issuance institutions to accept their conversion to normal money, compelling the source of electronic money to maintain a reserve with the Central Bank, the need for international legislative coordination and cooperation. Results of the test hypotheses is the first hypothesis Electronic money is a major change in the functions of the Central Bank in light of the transformation of the economy into a virtual digital economy. This hypothesis is very true because the use of electronic money in transactions affects the functions of the Central Bank as explained in the third axis. These functions change either because they are no longer as effective as they were or the need for such jobs will be eliminated. Other functions have emerged as the emergence of electronic money as a modern payment method. The second hypothesis the expansion of the use of electronic money would reduce the role of the central bank in the issuance of cash, but will not threaten its role in the management of monetary policy This hypothesis is true, since the spread of electronic money will probably lead to a reduction and perhaps the disappearance of the role of central banks in the issuance of money, but does not lead to the disappearance of its role in the practice of monetary policy and the settlement of obligations arising from taxes or transactions between institutions exporting electronic money. The third hypothesis In order to have effective management of the central bank on monetary policy there must be controls for the issuance of electronic money. This hypothesis is very true. The use of electronic money may encourage the increase of some electronic crimes, the phenomenon of money laundering, forgery and counterfeiting of money and it can also result in a lot of risks. Therefore, it is paramount to find some restraints to control the issuance and circulation of electronic money for an effective monetary policy. When examining the relationship between the volume of electronic money traded and the effectiveness of implementing the monetary policies planned by the Central Bank as a case study on the Arab Republic of Egypt during the period 2007-2016 as one of the largest Arab economies in the field of electronic commerce, there is a strong inverse relationship between the volume of electronic money traded in the market And the discount rate determined by the Central Bank during the period of study. In other words, increasing the volume of electronic money leads to a reduction in the effectiveness of the monetary policy of the Central Bank in terms of the discount rate. The volume of open market operations carried out by the Central Bank of Egypt during the study period. This means that increasing the volume of electronic money leads to a decrease in the effectiveness of the monetary policy of the Central Bank in terms of open market operations. In the Egyptian market and the size of the legal reserves determined by the Central Bank of Egypt for commercial banks during the period of study. This means that increasing the volume of electronic money leads to a decrease in the effectiveness of the monetary policy of the Central Bank in terms of the size of the legal reserve. The state must require giving development in the field of electronic money the right of interest and study, the economy of cash and paper, and not bank based on electronic transactions in financial institutions and banking, so requires The need to provide the infrastructure to deal with electronic money, such as ATMs and the final points of electronic payment "TPE"; Home banks, Stimulate merchants and places of service such as restaurants, hotels and institutions to accept electronic money in their dealings by giving them some advantages, To develop the culture of society with regard to the use of money and electronic means of payment; to provide adequate publicity for electronic money and the privileges it gives to its holder, International cooperation against electronic money frauds, Innovation of financial regulations in a way that coincide with monetary payment systems and money transfer via electronic means. The government does not mention “contacts” in its legal regulations texts instead of “communication”. The need to draft a law clarifying a set of conditions that ensure the issuer of electronic money to manage the various risks arising from this money in the future, The State should develop training and training programs for workers in banks to acquire the expertise necessary to detect attempts to manipulate and limit electronic money, Circulation of the use of debit cards, cash and postal cash payment; and social security cards, Development and modernization of electronic payment systems in line with global economic and technological developments, Adopting defense, regulatory, legal and regulatory lines that make it possible to deal with financial and electronic banking products to serve the national economy. Abdul, G.O. (2006). Money and banking. University Lourdes Foundation, Bahrain. Adly, S.N. (2005). Introduction to monetary and banking economics. Halabi Human Rights Publications, Beirut Lebanon. Ahmed, M. (2014). Economics of electronic banks. Knowledge Library, Cairo, Egypt. Ahmed, Y.M. (2014). Electronic money in the world economy. Modern University Library, Alexandria, Egypt. Ali, B. (2008). Lectures on Monetary Theory and Policies (Third Edition). University Publications . Berentsen, A. (1998). Monetary policy implications of digital money. Kyklos, 51(1), 89-118. Binder, M., Lieberknecht, P., Quintana, J. A., & Wieland, V. (2017). Model uncertainty in macroeconomics: On the implications of financial frictions. BIS (2004). Survey of developments in electronic money and internet and mobile payment. Burda, M. (2009). Macro économie, éditions de Boeck université, Paris, traduction de la 5éme édition anglaise par Stanislas standaert. Castells, M. (2017). Another economy is possible: Culture and economy in a time of crisis. John Wiley & Sons. Central Bank of Egypt. Statistical Bulletin, Miscellaneous Numbers (2008-2017). Gabr, H. (2008). Banking department. United Arab Marketing and Supply Company, Cairo, Egypt. Galí, J. (2015). Monetary policy, inflation, and the business cycle: An introduction to the new Keynesian framework and its applications. Princeton University Press. Forrest, J.Y.L., Ying, Y., & Gong, Z. (2018). A general theory of international money. In Currency Wars. Springer, Cham. 475-500. Hassan, K., & Ahmed, M., (2009). Money and Banking and Critical Theory. Dar Wael Publishing, Amman, Jordan. Mahmoud, S., (2005). Money and monetary policy. Concept-Objectives-Tools, Dar Al Fajr Publishing and Distribution, Cairo. Metwally, A. & Ahmed, E.S. (2010). Economics of money and banks. Dar Al-Fikr Publishers and Distributors, Amman, Jordan. Mishkin, F.S. (2007). The economics of money. Banking, and financial markets. Pearson education. Saeed, A.I. (2009). Legal protection techniques for e-commerce transactions comparative study. Halabi Human Rights Publications, Beirut, Lebanon. Popovska, K.N. (2014). The use of electronic money and its impact on monetary policy. Journal of Contemporary Economic and Business Issues, 1(2), 79-92. Pan, L. (2005). The impact of e-money on the monetary policy. Proceedings of the 7th international conference on Electronic commerce. 856-859. Rogoff, K.S. (2017). The curse of cash: How large-denomination bills aid crime and tax evasion and constrain monetary policy. Princeton University Press. Salehi, S. (2006). The alternative development approach in the Islamic economy. Fajr publications, Sutaif, Algiers. Qin, R. (2017). The impact of money supply and electronic money: Empirical evidence from central bank in China. Applied Economics Theses, 22(1), 108-115. Weale, M., Blake, A., Christodoulakis, N., Meade, J.E., & Vines, D. (1955). Macroeconomic policy: Inflation, wealth and the exchange rate. Routledge. Zine El-Din, S. (2003). "An economic study of some problems of electronic payment methods", Paper presented to the Electronic Banking Conference between Sharia and Law, held at the United Arab Emirates University in Dubai.